TMZ is reporting that Chumlee from Pawn Stars just bought a $100K Maserati sports car. I knew these guys were making money but wow! That’s an expensive car. 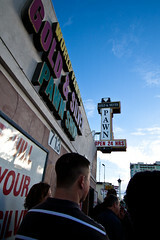 While Gold and Silver Pawn is a big money maker itself, Chumlee also gets money from doing endorsements and appearances. Not only is he the comic relief on the show, but he is the most popular. TMZ also reported that he bargained his way into only paying 85% of the list price on the Maserati. It must be nice to be Chumlee.